Thailand is a Southeast Asian country recognized as a destination for tropical beaches, grand palaces, ancient ruins, and Buddhist temples. Thailand has a tropical climate with a distinct monsoon season, which means that whatever time of year you visit, it’s going to be warm, humid, and might even be wet. There are three seasons in Thailand which can be described as the following: a cool season between November and February, a hot season between March and May, and a rainy (monsoon) season between June and October. Heat, humidity, and rainfall vary significantly, depending on where and when you’re traveling. Cyclones, also called typhoons, typically affect continental Thailand. While Vietnam, Laos, and Cambodia bear the brunt of these powerful storms from the Pacific, they still bring heavy rains. Thailand is typically prone to typhoons from June through December, although they are more common from September to November. Indian Ocean cyclones can occur year-round due to the warm sea but are most common between April and December. In general, Thailand is less affected by storms than its Southeast Asian neighbors. ﻿Chiang Mai and the rest of the northern region of Thailand enjoys cooler, milder weather throughout the year. During the cool season, average highs are around 80 degrees Fahrenheit (27 degrees Celsius), and average lows dip down to 60 F (16 C). Temperatures can go even lower up in the mountains, making it the only region in Thailand where you’ll ever need a sweater outside. Travelers should keep in mind that hot season temperatures can easily hit above 90 degrees Fahrenheit (32 degrees Celsius) or higher during the day. The weather doesn't cool off much at night, although higher elevations in some areas make it more bearable than in the rest of the country. In regards to inclement weather, the rainy season sees less rain here than in other parts of the country. Regardless, monsoon storms can still be dramatic and intense, especially during September, which is the rainiest month of the year. The best time to visit Northern Thailand is between October and April, although travelers should keep in mind that this is the peak tourist season. Bangkok's three seasons all share one thing in common: heat. The coldest temperature ever recorded in Bangkok was 50 degrees Fahrenheit (10 degrees Celsius), and that was back in 1951. Cool season temperatures are generally around 80 degrees Fahrenheit (27 degrees Celsius), so it’s no surprise that it’s such a favorite time to visit. During the hot season, visitors can expect highs to reach above 90 degrees Fahrenheit (32 degrees Celsius), with some sweltering days even hotter. If you’re visiting Bangkok during the warm season, make sure to plan activities around the weather, as the heat makes it difficult to walk outside for too long. For most of the rainy season, temperatures cool off by a few degrees, and storms only last an hour or two before passing. Tourist season is the highest in November through March for cities like Bangkok. Since the weather cools dramatically during December through February, travel is a bit more pleasurable during these cooler months. The weather in Southern Thailand follows a slightly different pattern than the rest of the country. There’s no cool season, as temperatures only vary by about 10 degrees between the hottest and coldest months of the year. It's typically between 80 and 90 degrees Fahrenheit (27 and 32 degrees Celsius) on average in cities like Phuket and the Central Gulf Coast. The rainy season happens at different times on the peninsula, whether on the east or west side. 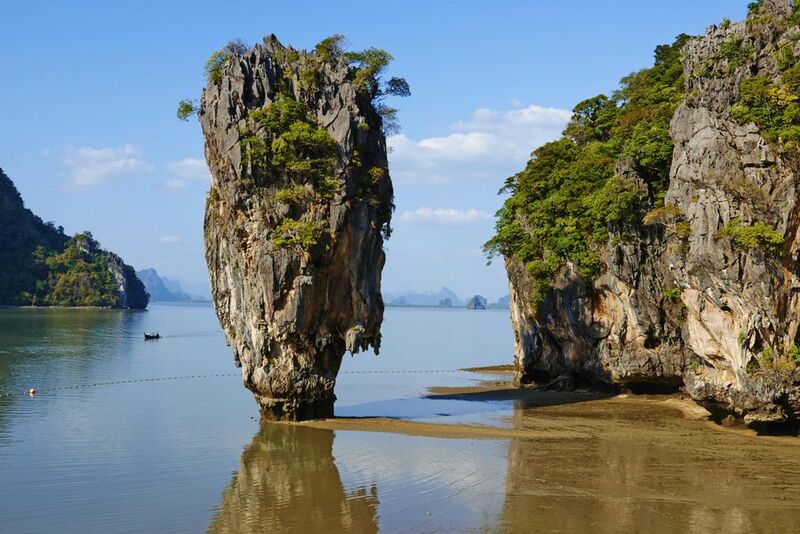 If you’re in the west, where Phuket and other Andaman Coast destinations are, the rainy season starts earlier in April and lasts through October. If you’re on the east side, where Koh Samui and the other Gulf Coast destinations are, most of the rainfall happens between October and January. Tourists most commonly travel to southern Thailand between November and February when the weather is cooler and drier. To avoid hot weather and monsoon season, it's recommended to visit during the more popular months. Early spring in Thailand is still considered the dry season in Thailand and is quite hot, with temperatures during the day regularly exceeding 95 F (35 C)—if not more. Humidity matches the temperatures, which means being outdoors can be almost unbearable for those who are sensitive to heat. Given the temperatures, May is among the most affordable months to visit Thailand. What to Pack: Pack light, breathable clothing, preferably moisture-wicking. Spring is hot and wet, and you'll want to dress accordingly. Prepare yourself for more high temperatures in the summer, with the addition of heavy rains. Prices are cheaper for travel and accommodation during the summer, but temperatures are usually upwards of 96 degrees. June, for example, averages 90 F (32 F) with ocean temperatures of a balmy 82 F (28 C). Koh Samui is typically the warmest location during the summer months. If you're sensitive to heat or high humidity, these months are best avoided. What to Pack: Like spring, summer in Thailand is scorching. In addition to comfortable clothing, you don't want to forget bug spray, sunscreen, and a good hat to protect you from the sun. Summer is also quite wet, making a lightweight poncho or raincoat an indispensable part of any traveler's wardrobe. While Thailand doesn't experience traditional fall, September marks the end of the rainy season. Luckily, temperatures begin to drop as well, averaging around 86 F (30 C). This is still considered the low season too, which means visitors will find uncrowded beaches and a warm sea. October is dry and pleasant as well, but this marks the return of tourists to the country. The rainy season ends for good November, except for the southeastern part of the country. What to Pack: In fall, you can begin to pack away your raingear, but temperatures are still quite warm so dress accordingly. Winter is Thailand's most popular season for beach visits and sightseeing. The winter is dry and warm, with temperatures of around 86 F (30 C) in the south and as cool as 75 F (24 C) in the country's northern reaches. December and January are the country's most-visited months, but February is popular as well and still a great month for beach-going; water temperatures usually hover around 80 F (27 C). What to Pack: Winter is Thailand's "coldest" season, but cotton and linen fabrics are still a must. In the country's northern more mountainous regions, a sweater or other light cover-up might come in handy for cooler nights.